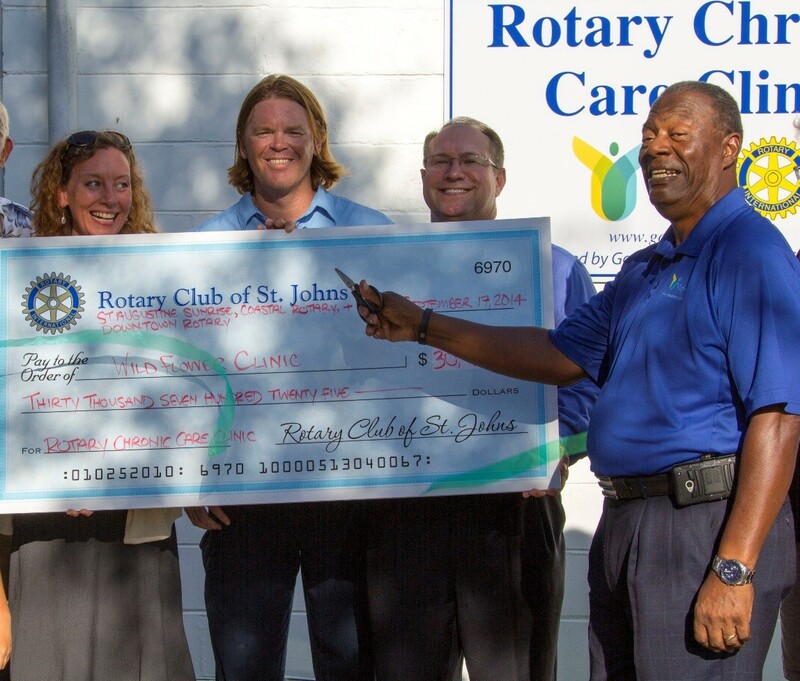 Rotary Club of St. Johns, St. Augustine Sunrise, Costal and Downtown Clubs - work together to donate $30,725 to the Wildflower Clinic for the development of the Rotary Chronic Care Clinic. Donation will be used for additional staffing to provide over 4,000 additional patient visits to people with medical needs. For more information on the Wildflower Clinic, Good Samaritan Health Centers go to http://www.goodsamstaug.org/. They provide free medical and dental service and health education to St. John residents who are uninsured and whose income falls at or below 200% of the Federal Poverty Guidelines. See below ribbon cutting picture with Rotary Club of St. John President Tony Lego (middle right), Wade Taylor (middle left), Amanda Perrin presenting check.